I think rugs can be confusing to buy. What is the right size? Do I center it in the room or with the furniture? Should I use colors not in the room? Do all of the chair legs need to sit on the rug? 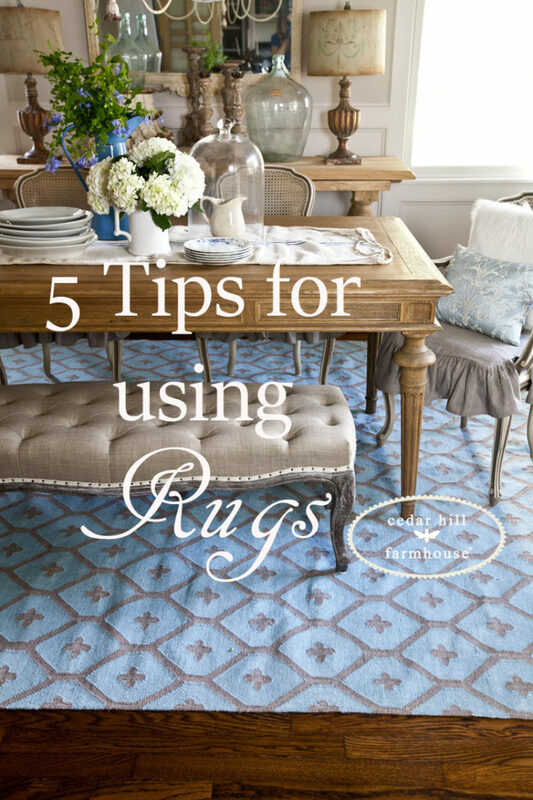 Today I am sharing 5 tips for using rugs in a room. Well these are all awesome questions, and although I am not an expert, I am happy to throw in what I think. You knew I was going to do that, right? First I want to show you how the room looked when we moved in without a rug. Yes we had a different table also. Here is the room with the new one. Now let’s talk about the typical questions people have about using rugs. Can you put a rug on top of carpet? I have heard all kinds of answers on this one. I think it works if the carpet has a flat pile like a Berber carpet, otherwise I don’t recommend it for a variety of reasons. Firstly the carpet might be too squishy under the rug if it is a plush carpet. I found lots of answers on this question, but my rule of thumb is the larger the better. Buy the biggest one you can afford that will fit in your space. A smallish rug is going to look skimpy. Should all of the chair legs be on the rug? Some experts say they should. I’ve seen some rooms that look fine where not all legs are on the rug. For a dining room, you really want all of your chairs to fit on the rug even when they are pulled away from the table a bit. For my dining room, I went with a 8’x10′ rug. As you can see there is about 2 ft of hardwood floor that shows around the edges of the rug. I’ve used a 9’x12′ ft rug for my living room, and that’s the perfect size for that seating area. Do I center the rug on the room or the furniture arrangement? I always go by the arrangement or the dining room table. But if the rug is almost as large as the room, you can center it on the room. For my dining room, I centered the rug under the table. Can you add a rug that has colors not in your room? Absolutely, and I see designers do it all of the time. Actually that is exactly what I did in this room. There really isn’t much color at all in here, but I brought in the blue with the rug. The rug also repeats the tan color of the chair covers. I don’t really have blue in this room, so technically I did add a color to the room using a rug. I’ve seen Oriental rugs with lots of colors that are not in the room. Just be sure if you are using a bold-color rug that you use it in a room with other strong colors. If you have neutrals like I do, then I think a more subdued rug color and pattern works best. This post is sponsored by Annie Selke who makes Dash and Albert rugs. This is the Elizabeth rug. My favorite rugs are flat weave rugs and this one is gorgeous! This one looks and feels like wool, but it is actually an indoor/outdoor rug. I don’t know how they do it, but it looks amazing in person. I would never guess it wasn’t wool. The color is rich and gorgeous. Dash and Albert are some of my very favorite rugs. I love flat rugs with a simple pattern and they have several beautiful options. Seriously go check them out! Don’t forget my giveaway going on right now. Every comment automatically enters you to win!! fine print here. Thanks for all of the good tips! Love your dining room rug. I would certainly think indoor/outdoor rugs be a great option under a table as far as upkeep and spot cleaning. Thx so much! I so agree with you , Michelle . U just made a very practical reason for using indoor / outdoor !!!! I like the blue in your dinning room rug , I have rug in my living . The furniture is not able to fit on the carpet so I’m fine with the placement. Love how you use rugs to give ambiance. This post is quite helpful – I’ve struggled with figuring out what size of rug to put in various rooms. Thanks for the tips! Very pretty room . Love the bench. Great ideas. Love the blue rug in dining room. I loved the article on rugs,and I just bought a rug for my living room. A blue indigo vintage one that I think will look “old world” with my french accents. Thank you . I have trouble choosing rugs…but this post was very helpful! ? I never would have thought to use a color that was not in the room, like your pretty blue! But I can see now that it does work! ? Love the blue rug. I have an indoor/outdoor rug. Cleanup is great. Mush more forgiving than wool. Have a 4 X6 in kitchen I put on deck and hose off. I enjoyed this very much but I absolutely love the rug! Thank you your post was very helpful. Really loved your article. Very helpful. Must go bigger! This post came at the perfect time as I am pulling up the carpet in my family room and laying hardwood down. It’s a big space so I was trying to decide how big of a carpet I needed. Thanks for the helpful hints. You answered the issues well! Love the DR!! Great rugs!!!! But a little pricey for me. Any other suggestions to shop for rugs would be welcome. Looking for a teal color. Love your blog. Very classy. Read your site all the time. Thanks for all your knowledge. Great guide. Just inherited an Oriental and needed help on where to use. Great Q and A on rugs. Looking at the room made me want one on mixing wood tones. I always feel challenged to have close to same or painted wood. I see photos with mixes and love it but hate my attempts. Would love tips and tricks on achieving cohesive wood tones. Beautiful room, great tips. Always wondered about how big a rug should be for a dinning room. Great post – we must have made some of the same mistakes because we’ve both come to the same conclusions. Love your blog. I am currently having some issues with getting rug for living room, thanks for the tips. Beautiful room. I love that rug. What a difference that pop of color made in that room and it made it feel cozier. Thanks for the great tips! Love the room and your house! The rug really gives that room a pop of color! Thanks for these helpful tips! What a beautiful rug! Thanks for the tips. i love that rug. i had seen it and thought about buying it to put on top of my sisal. does it lay flat? i have a couple of her rugs and they wrinkle up pretty bad. Yes it is flat Sherry. If they wrinkle, you probably need a rug pad. That should fix it. Thanks ~ these are great ideas. Love the blue in your dining room. You’re right a too small rug under a table always looks too skimpy. Better no rug at all that too small. Your rug looks gorgeous! Thanks for sharing. Like the blue rug and especially the pattern, lookin’ good! I love the way you have decorated your Dining Room!!!!! I have a 100 year old dining room table and buffet that my Grandmother passed down to me that is the same EXACT color as yours . I have been trying to figure out what to do with the seating as due to age and wear most of the chairs are very weak and in need of costly repairs. I saw your post and had an AHA Moment when I spotted the awesome bench seating you have in your dining room! I love how the fabric you used on the bench coordinates so beautifully with the chair slipcovers, rug, and pillows. Thanks for the inspiration!!!!!! By the way, I like the bench seating idea as my home is not as big as yours and with a bench I can save visual space by sliding it under the table a bit. Did you make your bench or buy it & the slip covers at the same time? I’m trying to figure out a cost effective way to make or purchase a bench. I already have neutral chair slipcovers but trying to figure out the bench. Thanks! Juilia, I did not make the bench. I did make the slipcovers for the chairs. It is amazing how a rug can transform a room! I thought your dining room looked lovely before, but the rug just added a lighter feel to it (along with the slipcovers and curtains). I am struggling to find a light colored rug that won’t get destroyed by everyday wear and tear. I would be interested to know how it holds up. Dash and Albert rugs are really beautiful. Your blue dining room rug is gorgeous. I totally agree, buy the largest size rug that will fit in the room. I tried using a 8×10′ rug for my family room and it did look skimpy so returned it for a 10×12′. Made a world of difference. 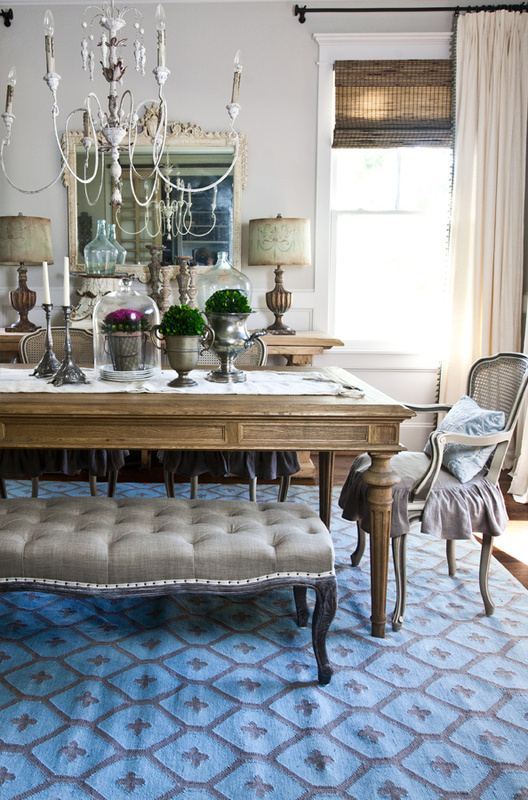 So gorgeous and we are loving how the Dash & Albert Elizabeth rug looks in your beautiful dining space! So happy to be included. Jess, I think we all agree, it’s stunning!! I love your space. I love the rug, but the olive buckets on the table I adore. Love the rug. I had bought a sisal one from Ikea and although it looked lovely in my dining room , it kept moving, plus it was a pain to move the chairs. So, needless to say it’s gone. I will definetly check out your source and hopefully my room will be complete again. Thanks for your handy tips.. much appreciated. Can you please let me know if you used a pad underneath the rug? We recently put in hardwood floors, and I am nervous about using the correct pad underneath rug. PS, I love seeing transformation of your room over time….. I think you are making very wise choices that seem to work together well! I did not. You have to be very careful with rug pads. Make sure you use a very good quality one, because some of the cheap ones can damage your floor Michelle. I probably should, but it’s a lot of extra work to use them. Thanks for the tips. I really need them. The only rugs, if you call them that, are at the three entry points to my house and one on the front porch. My problem is that the rugs I see in the stores like Ikea and Homesense, are usually too small for my space. And large rugs come with a very large price. Now that I look around my family room, the room looks half dressed. What to do when you can’t afford a rug? Good question Carol. Sometimes people paint a rug on the floor, but I’m concerned about what a permanent solution that is. Thanks for all the tips, very helpful. I love the new rug, and love that it is indoor/outdoor. Carmellia, I think the best option is a rug pad. They are supposed to keep the rug from shifting. Smart use of indoor/outdoor rug for dining room. Practical and pretty! Perfect timing on these tips, thank you. I had already bought rugs for our new home about a year ago but before they were delivered we rescued a near death puppy; $1500 in vet bills and a new puppy in the house we set the rugs away in storage and forgot about them. Fast forward the puppy is over a year old and now is house broken so this reminded me I have 4 rooms of gorgeous new rugs to use over the hardwood floors. Every room is white and the living/dining room furniture is also white so the rugs are really needed to bring pops of color in. Thank you so much for the reminder of my rugs. As always you are the best! Any advice for those of us stuck in apartments? I’ve got a large living room – 14 x 22 – and the most boring bland tan carpeting ever. I’m trying to figure out whether to go with a rug under the seating area (sofa, chairs, table) or stretched into the great open area between the end of the sofa table and the entertainment group on the wall. The second means the rug would be seen much better – but I’m concerned it would also look kind of silly – a rug smack dab in the middle of the room with only a couple of chairs resting on the edge. Shel, I think I would center it under the seating area. You can also layer several rugs so you don’t have to buy one big rug. I’m glad to get answers to the rug question. This was very helpful. Really love your blog and the house has turned out so nice! Questions, where did you get the chandelier? Stunning and my dream chandelier. Thanks! That is from Horchow Jennifer. Thanks for those good hints. I’m going to break down and buy 2 rooms in my house at some point!! Thanks for the info!!!!! As always so useful!!!!! I have an indoor/ outdoor rug in my Breakfast Room….I absolutely love it….. no worries with spils…. and up keep has been great!!!!! Roxann…. I really appreciate this post! I am looking to buy an area rug and with so many options, sizes, etc. have not made a decision. This really helps, than you! I love this. Great tips. Thanks for the run information. Do you need a rug pad if your rug is on carpet? My rug keeps moving even though it’s on a carpet. Would a pad help? I think it would Liz. Love the way you used color. The accents look great! I love rugs and hardwood floors. Thank you for your tips and blog. Your french country home is amazing, I love to look at all of your suggestions. My question is can I layer rugs? In my study, which I am still working on, I bought a neutral sisal rug, size 8×10. My home is very neutral, cream, taupe, blues with stained oak floors. I love the rug, but am finding that it is not very comfortable, though stylish. I thought it might be fun to angle another simple rug in there. Yes I love layering rugs, especially on top of sisal rugs. It sounds gorgeous. Can you take the rug outside and hose it off? I think so, but haven’t done it myself. Hi Anita, thank you for the wonderful tips! I absolutely love the rug you’ve chosen for your dining room and really appreciate you providing your sources for it and other items you use in your decor! Blessings to you! Makes me wonder if I should use a 9′ 7″ x 9’9″ Oriental rug in a 10′ x 14′ breakfast room–just about a 1″ border of hardwood on each side. Would I be better off to have no rug? I think I would try it Marilyn. Unless you really want more of the floor to show. Anita, your dining room is so pretty. Blue is a favorite color of mine and your rug looks so nice with the neutral colors in the rest of the room. I don’t think I would have thought of using a blue rug there, but it works beautifully. I have been trying to add some interest to my living room which has a medium grey couch, a muted sage and ivory wing chair and a plain wooden antique rocker. When I look at the room as a whole, it looks so bland. I had a terrible rug in there–pale sage and not holding up well at all, so I got rid of it and at an auction, I bought a rug with an oriental design, the main color being navy blue with various other colors in the design. I had been avoiding patterned rugs in my search, but when I saw this rug I liked it and tho’t it was better than the other one even if it wasn’t exactly what I’d wanted. But now that it’s on the floor in front of the grey couch, I ‘ve come to really like it. The navy is compatible with the furniture and the colors in the design add some interest to the room. I’m not done, by any means, with working on that room, but I feel I’ve begun to make it less bland. All this to say that sometimes what you think won’t work turns out to work really well! Thanks for your advisory on rug selection and placement. I still need a rug for my dining area, so I will remember some of your points when I get to that room. Thank you for sharing. Sitting here with naked floors trying to decide what I need for rugs in size and colors. Have the berber carpet, now can cover in two of the rooms. I think a rug grounds your furniture to the room. Your choice of rug is very pretty for your dining room. Love your room! And love, love the rug! Anita, great ideas for rugs! Your dining room is lovely! I am drawn to anything blue! It’s one of my favorite colors! 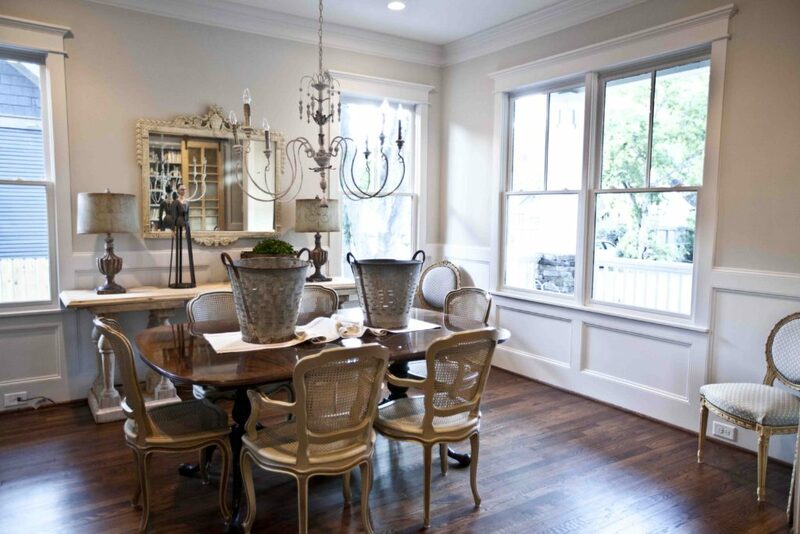 Our dining room has white wainscoting, blue gingham walls, hardwood floors and an oval country blue & white braided rug! 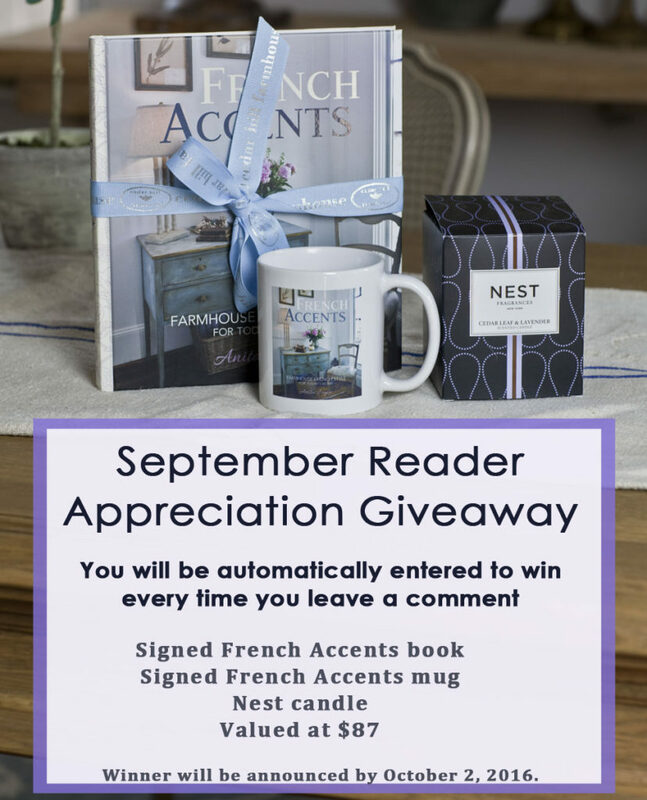 Love your country French décor! It’s gorgeous! I ordered your book today and am really looking forward to receiving it! Thanks for the tips. Although I’d love to replace a couple of my area rugs, they’re in very good shape and still go with my decor. Lol…it’s more a matter of wanting to update the look more than anything else. My frugal nature says to just be satisfied unless I find something too good to pass up. Love the rug and the room! It’s just beautiful Anita! I work at a fun shop that carries Dash and Albert rugs and they are really pretty and well made. We sell a lot of them. Thanks for the tips! Fabulous tips! Love your rug and beautiful home always! Yes there is a link in the post to Dash and Albert rugs Glenda. You can also find them in stores. They are gorgeous rugs and I have always loved them. Love,love,love your dining room rug. Thanks for the tips. I’ve struggled with what size rug to use. Your tips were very helpful. I love your blog! You have a beautiful home and inspire me. The rug post was very helpful. Who knew that was an indoor/outdoor rug!! Thank you! I love Dash and Albert Rugs. They have such great patterns. 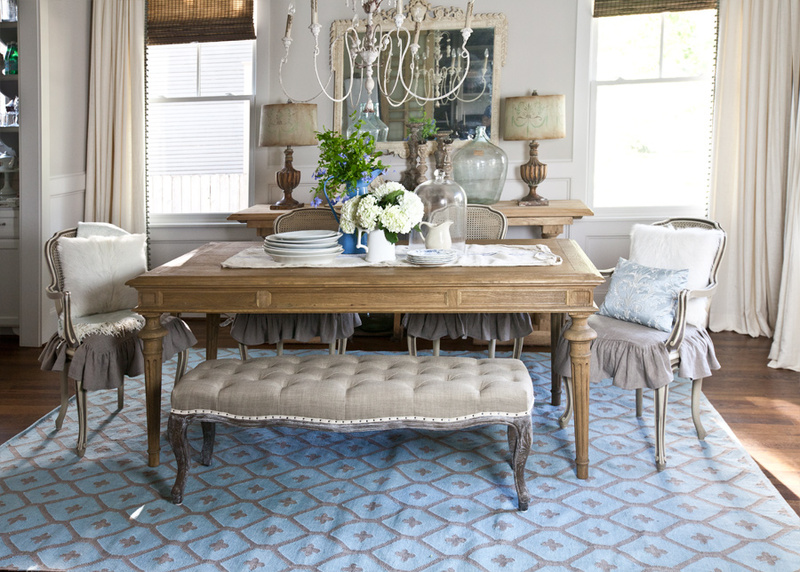 Your blue rug looks great under your diningroom table. Well, thank you again for this post! I started brainstorming after I read your post. Well, I ended up buying a nice oversized rug instead of the smaller ones I was looking at. I have been on the fence for such a long time as to the proper size I should purchase. I admit I spent more than I had originally budgeted but am happy with the way it makes the room look. Thanks again for the tips!!!!!! Love your blog! Your post are always so interesting and hrlpful. 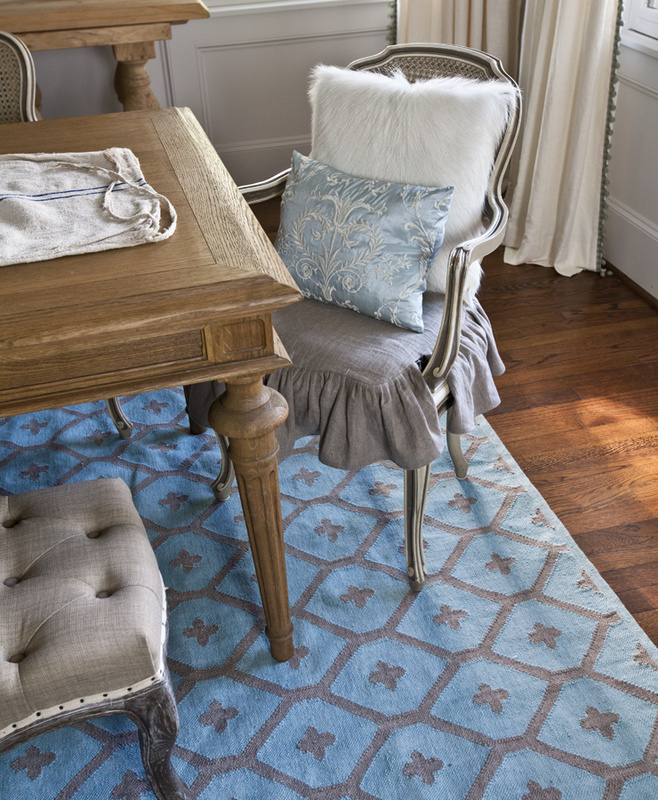 The blue rug in your dining room is the perfect choice ! Simply gorgeous ! Beautiful dining room rug! The 5 tips helped so much because we are switching out carpet for a hardwood floor in our family room, & shopping for an area rug! Also wondering if we need a carpet pad too? There are pros and cons. Be sure you get a good one if you add one. I love these tips! You always cover so many things with your tips! Thanks! LOVE that shade of blue! I adore Dash and Albert rugs. I’ve always loved their colors and styles. Just wish they would go on sale so I can afford to buy one! That is a beautiful rug. I like the colors and the design. Thank you for sharing. Although I love your book and style I disagree with the idea that walls need a strong color in order to carry a colorful rug. I love the Scandinavian design vibe where they almost always have shades of white on the walls and a colorful rug. As a colorful rug person, and a colorful art person additionally I need a white wall in order to cool things down sufficiently to tolerate the saturated colors of my rugs, pillows, and art. In fact I struggle between my love of color and your look which is so soothing , calm and peaceful. I can’t decide which I feel better around! Thanks for reading. Jan excellent point. Everyone decorates in a different way. The rug information is well worth keeping. Your dining room looks so cozy now the rug is in place. Thanks for your beautiful inspiration blog. This couldn’t have come at a better time..
Love your room as well as the rugs. Thanks also for your rug tips. It is very helpful.